Ancient kings were quite different from medieval and modern monarchs. In this issue of Ancient History, we explore the concept of ‘royalty’ in the ancient world. Josho Brouwers, 'Royalty in the ancient world - Historical introduction'. Eugenia Russell, 'Greek writers on the ideal of kingship - Basileus'. Andrew Calimach, 'A Greek tale mocking all tyrants - Archias and his two boyfriends'. Joshua Hall, 'The kings of ancient Rome - Between myth and reality'. Michael J, Taylor, 'The court of Hellenistic kings, 359-31 BC - Friends and parasites'. Giuseppe Restaino, 'A "golden house" worthy of a king - Domus Aurea'. Rebecca Batley, 'Role of the empress in second-century Rome - Whore to goddess'. 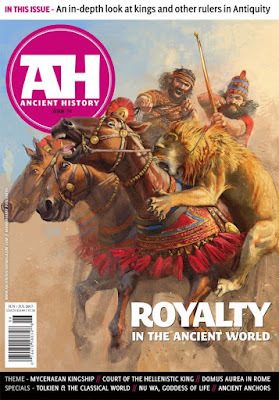 Josho Brouwers, 'Recommended books on ancient royalty - Beyond the magazine'. Marc G. DeSantis, 'Of J.R.R. Tolkien and the ancient world - History as inspiration'. Tang Long, 'The Chinese goddess of life - Nu Wa'. Holger Michiels, 'The first modern anchor - The two-armed anchor'. Graham Sumner, 'The Roman army on screen, part 7 - King of Kings'. Fausto Bica & Josho Brouwers, 'Periander of Corinth, tyrant or sage - Periander'.